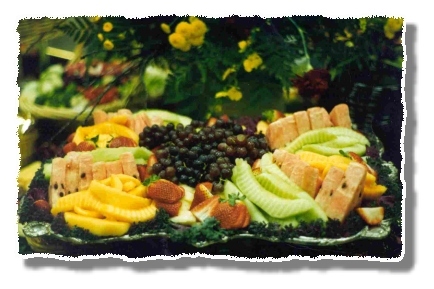 Cold Platter Full Service menus, Cutting Edge Catering, Catering to your every Whim! Serving Joilet and the entire Chicagoland area! Going to a Party? Bring a Platter & Be the Hit of the Party! Cheese slices surrounds a wedge of Brie with Brown Sugar & Pecans. Gouda Wedges & Cheddar Cubes add to the experience. Cheese, Herb Boursin, Smoked Cheddar & a Goat Cheese log. Strawberry ¤ Mandarin Orange ¤ Sun-dried Tomato with Pesto. Coins & Bell Pepper Strips are elegantly displayed. & then Chilled. Served with Balsamic Vinaigrette. Salami. Includes a variety of Crackers & garnished with Grapes. Cheeses accompanied with Pepperoni & Cubed Hard Salami. Includes a variety of Crackers. Served with French Bread & Balsamic Vinaigrette. Peppers, Black Olives & Sour Cream. Served with Tortilla Chips. Garnished with Capers, Dill Sauce, Lemons, Limes & Crackers. Shrimp, Crabmeat, Cream Cheese & Cocktail Sauce. Includes a variety of Crackers & Bread Rounds. Great for Lunch, Snacks or some Late Night Munchies. ¤ Honey Baked Ham with American ¤ Turkey Breast with Swiss. Bacon, Lettuce & Ranch Spread wrapped with a Flour Tortilla. Medium Roast Beef ¤ Turkey Breast ¤ Honey Baked Ham all Thinly Sliced & Artistically Arranged on a Platter. the “Deli Condiment Package” will complete this platter. Thinly Sliced American h Cheddar h Swiss Cheeses.